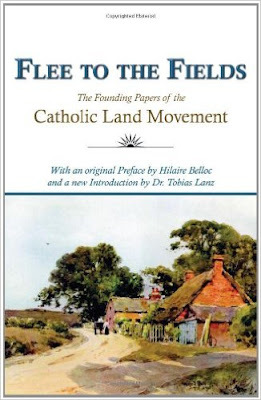 I see that Rick Saenz has already written about the book, Flee to the Fields: The Founding Fathers of the Catholic Land Movement over at his blog, Dry Creek Chronicles. So I suggest you go there and read what he has to say. Would you be, along with some of the other fine men who are writing about Christian agrarianism (and the continued infringement on our liberties given to us by our forefathers), thinking of possibly forming the Protestant version of NCRLC? Supporting rural and agrarian family life but within the framework of the Protestant worldview? The slope towards Gomorrah gets slicker, but some of us are stopping the decline in as much as we are empowered by Our Father: by example ~ by teaching ~ in words and deeds and through much fervent prayer. Your comment has led me to some deep consideration. I personally do not feel led to form a Protestant version of NCRLC. And, after learning about ACRES of Hope America See the blog I've recently posted about this ministry), I no longer think anyone needs to establish a Protestant version of NCRLC. The Lord appears to have put it upon Barry & nLynne Morgan to do and I think we who believe in the mission should support it. Your question has also brought to mind the idea of a National Christian Agrarian Organization, an idea that has been tossed about from time to time in the past year or so. Such an organization would be less of a ministry and more of an association of like-minded folks, trying to spread the CA message and attract more members. I have different feelings about something like that and have just posted some thoughts along those lines.